It's the season for round numbers here in Los Angeles. The one you surely know about is the 10th anniversary of the Walt Disney Concert Hall the LA Philharmonic has been promoting. But there’s a more important big anniversary downtown. That one is a 50th and it’s the number of seasons now being celebrated by the Los Angeles Master Chorale now under Music Director Grant Gershon. On Sunday the chorale kicked off their big season with a mega show. A nostalgic look back on the first fifty years of the ensemble through the musical eyes of its four former and current music directors. A hodge-podge of pieces by dozens of composers was presented to provide an overview of the musical interests and temperments that have helped shape the group's repertory. And while it may not have always been the most cohesive performance musically with such a scope, the show did provide a great sense of the LAMC’s history and direction and had a lot to say about where the group is right now. It’s worth remembering that at its inception, the LAMC was an oddity – a resident performing chorale ensemble in a major Americna arts organization that not only collaborated with the local orchestra, but also provided a season of independent chorale performances. Founding Music Director Roger Wagner managed to put choral music front and center in the genesis of LA's Music Center giving it a place in the city's largest arts organization unrivaled elsewhere in the U.S. His vision paid off grandly and much of Sunday's anniversary program focused on the cornerstone pieces that made the company's reputation in the first two decades under his leadership. The evening moved on revisiting the Scottish works and influences that were a hallmark under John Currie's tenure with the organization complete with bagpipes and drums. Some of the strongest musical moments followed a long break when the chorale performed pieces from favorite composers of former Music Director Paul Salamunovich. Associate Conductor Lesley Leighton led works of Maruice Durufle and Gershon presented Morten Lauridsen's O Magnum Mysterium. It is precisely these sorts of performances that established the chorale's international reputation in the 90s and they continue to be a high water mark in the artistic life of the company. But all of these works still had a rough hewn quality in their performance Sunday. 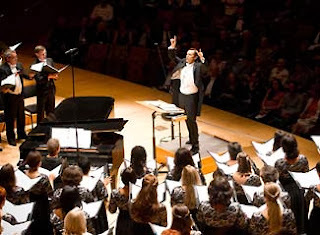 There was a disjointed feeling to this large and diverse program until the audience and the many vocal artists of the chorale turned the corner and dove into the last decade or so of the organiztions history. These, of course, are the years under current Music Director Grant Gershon. And if there was any lesson to be taken away from this anniversary concert Sunday it was that while the history of the LAMC is indeed formidable, today, this chorale is musically Grant Gershon's in its very heart and soul. The emphasis on newer music and on an increasingly diverse world of chorale music traditions has been a hallmark of this last decade. And Gershon has shaped an ensemble that thrives on the unexpected. Reeling from Nyowon Woo's ME-NA-RI to fragments from Rachmaninoff's All-Night Vigil to Ellington's setting of The Lord's Prayer and finally to Gaspar Fernandes' Dame albricia mano Anton, the chorale sounded seemless and natural. The warmth and energy the chorale projected in such rapidly shifting and diverse settings was astounding. In fact the vocalists seemed to thrive on it. Almost as if to say "now watch me" the chorale swelled with its own light and a sense of power. Everything clicked suddenly and the evening climzxed with a performance of Randall Thompson's Alleluia which provided an opportunity for the chorlae memebers to be joined by the many LAMC alumni present who joined the current members on stage. It was an exciting moment and one that was undoubtedly special for everyone involved. And it was a brillinat start to a season that encapsulates everything this single evening was trying to achieve with performances of the Carmina Burana and Bach's B Minor Mass to work from Lauridsen, Recih, Lang and Salonen. Gershon and his LA Master Chorale aren't about to forget where they've been. But don't think for a second that they are about to take a rest.